William Morrow Paperbacks, 9780061568251, 336pp. An elephant never forgets . . . but can she dream? 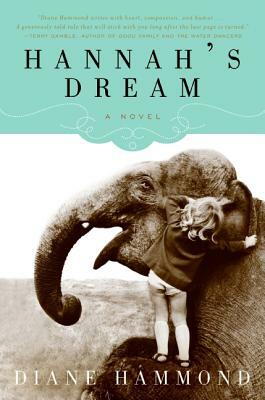 A charming, poignant, and captivating novel certain to enthrall readers of Water for Elephants, Diane Hammond's Hannah's Dream is a beautifully told tale rich in heart, humor, and intelligence. Diane Hammond is the author of the critically acclaimed novels Seeing Stars, Hannah's Dream, Going to Bend, and Homesick Creek. She served as a spokesperson for the Free Willy Keiko Foundation and the Oregon Coast Aquarium and currently lives in St. Paul, Minnesota, with her husband and their three Pembroke Welsh corgis. Several characters in Hannah's Dream have or are given mixed, scrambled or multiple identities. Harriet, for instance, takes on the persona of Max Biedelman. Which other characters have identity issues, and why? Animals both large and small play key roles in the lives of the characters in Hannah's Dream. Why are they so important to their owners and keepers? In what ways are the various animal/human relationships similar, and in what what ways are they different? Harriet Saul is initially portrayed as the villain in Hannah's Dream, but does she deserve it? Did she change over the course of the book, and if so, how? Why? What's the deal with Johnson Johnson? Is he a savant, a fool, or a genius? Neva Wilson describes Hannah as a "charismatic mega-vertebrate," a description that also includes whales, dolphins and other large and popular mammals. Do these animals have a place in today's zoos? Why?